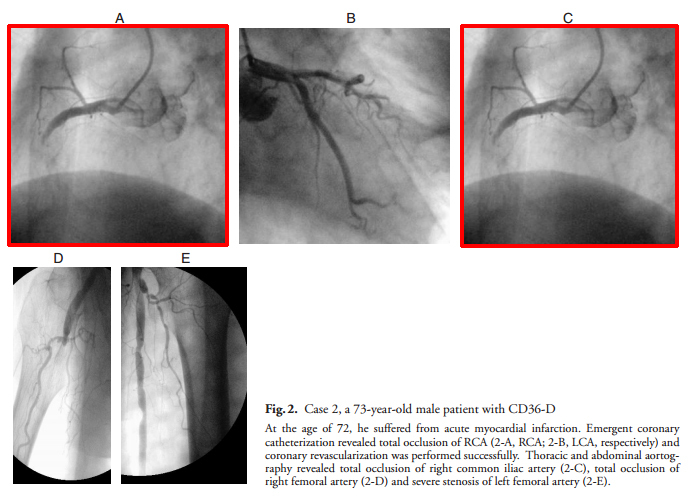 小室一成グループ　論文疑惑: Patients with CD36 deficiency are associated with enhanced atherosclerotic cardiovascular diseases. Patients with CD36 deficiency are associated with enhanced atherosclerotic cardiovascular diseases. J Atheroscler Thromb. 2012;19(3):263-75. Epub 2011 Nov 10. 1) Department of Cardiovascular Medicine, Osaka University Graduate School of Medicine. 2) Department of Somatic Stem Cell Therapy, Institute of Biomedical Research and Innovation, Foundation for Biomedical Research and Innovation. 3) Health Care Center, Osaka University. 4) Department of Biomedical Informatics, Division of Health Sciences, Osaka University Graduate School of Medicine. 5) Kure Heart Center, National Hospital Organization Kure Medical Center. This work was supported by the following grants: a grant-in-aid for Scientific Research (No. 18659267) to S. Yamashita from the Minist of Education, Science, Sports and Culture in Japan; a grant from Mitsui Life Social Welfare Foundation to S. Yamashita; a Takeda Medical Researech Foundation Grant to S. Yamashita; and in part by the Program for the Promotion of Fundamental Studies in Health Sciences of the National Institute of Biomedical Innovation (NIBIO) to A. Matsuyama and S. Yamashita.